SoftPlanet makes it possible for everyone to get free NaviFirm Plus download directly from our servers. There is no registration needed for downloading. 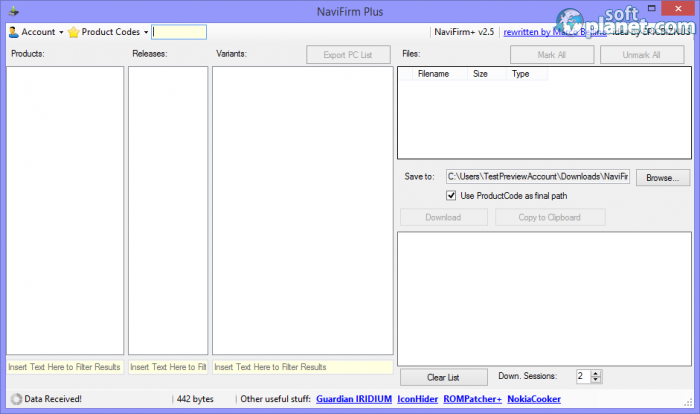 NaviFirm Plus 2.5 is a small-sized, free-of-charge and easy-to-download application, which is designed to work only on Nokia phones. Its job is to find and download or copy to the clipboard the latest firmware for your phone. The developer highly recommends that only advanced computer and phone users should use the program without any problems whatsoever. The latest NaviFirm Plus version has improved the welcome message and some minor bugs have been fixed. Users of Windows XP, Vista, 7 and 8 can use this program. There is no help support other than an English user interface. This program obtains for you the latest lists of product codes and the right product code can be filtered from all the listed ones. Because NaviFirm Plus is a highly dedicated-to-phones maintenance program, it has a kind of unique user interface. There are only two menus on top where you can create your account and add the phones' product codes. When one of the listed models is selected, the program shows all the related to that phone files, listed to the right. The Download and Copy to Clipboard buttons are underneath. There is a preview window where you can see the progress of all the downloads. Users can filter the results in each of the three columns by using the yellow boxes at the bottom. To use NaviFirm Plus is not so hard, but it is not simple too. It is highly advisable that you backup your phone's current firmware, settings and all contacts before you use this program. First you have to find your model in the list on the right. Then you have to choose which release and variant your particular phone is. Then you need to pick the right file for you if more than one is listed there. Finally, simply click on the Download button to get the file. In conclusion we can say that NaviFirm Plus 2.5 is a great program but only for people who know how to apply it. It is not recommended for people with no or limited technical skills and knowledge. Our security scan shows that NaviFirm Plus is clean from viruses. The current version of NaviFirm Plus has been scanned by our system, which contains 46 different anti-virus algorithms. That ensures that NaviFirm Plus 2.5 is 100% safe for your computer.